This industry is strong, at least among its two major players: American Cruise Lines and the American Queen Steamboat Company. Both have extensive and varied schedules for 2019. That’s an important presence for travel and booking companies, supply industries and numerous tourist related destinations which depend on vacationers’ discretionary income. Importantly, the industry is investing in itself, not just playing out old assets and venues, trying to get by with new paint and better carpets. These investments will be highly visible in 2019 and 2020. Just as noteworthy is that this big picture is changing, for the better, and is likely to include new pivotal, high-profile players. In December, the storied Delta Queen – on America’s rivers for a century – was given the okay, after 10 years in drydock, to resume overnight passenger cruising. It literally took an act of Congress. Second, Viking River Cruises is reportedly close to a deal to build new vessels, a project first announced in 2015, put on hold in 2016, out of sight in 2017, then announced as ready to go in September 2018, although even as the year ended those big plans still haven’t turned into action. The big news, though, for 2018 was from American Cruise Lines’ (ACL) operations and the company’s dramatic, game-changing new modern riverboats that started to come on line in the second half of the year. ACL has plans for five new modern style riverboats, the first joined the fleet this year, the second in the series is nearly completed and work on the 3rd has already begun. American also added a new small coastal ship to its fleet in 2018, American Constitution. American Cruise Lines is the largest cruise line in the U.S. with a fleet of 11 new small ships, all under 200 passengers. On August 1, American Song, “the first modern riverboat in US history,” moved under its own power at Chesapeake Shipbuilding in Salisbury, MD, to the yard’s outfitting bulkhead for final touches. Progress was on schedule for the vessel’s inaugural cruise in October, on the Mississippi, operating there for the balance of 2018. (The 2018 inaugural season was sold out.) In 2019, American Song will be repositioned to the west coast, operating on the Columbia and Snake Rivers, starting in March. In November, ACL launched its second new riverboat – American Harmony, also built at Chesapeake Shipbuilding. Construction also started on the third ship in November. When finished, American Harmony will start operations in summer 2019 on the Mississippi. This new equipment gives ACL a new dynamic, commented company spokesperson Alexa Paolella. ACL can now offer three distinct ship styles and broader travel itineraries, she said, able to draw from broader travel markets. In 2019, ACL will have 3 vessels operating on the Mississippi system. This is a company in growth mode, ready for significant new customer demand. There was more big news in December when President Trump signed legislation providing an exemption for the Delta Queen to return to river carriage. The Delta Queen, now drydocked in Houma, LA, is America’s last authentic overnight steamboat and a National Historic Landmark, cruising since 1927. Because of its wooden superstructures, the DQ requires an exemption from the 1966 Safety at Sea Act in order to carry overnight passengers. In 2008, that exemption was not renewed, unlike the previous 40 years, and the ship was sidelined. In the past 10 years the ship has served as a floating hotel in Chattanooga while the Delta Queen Steamship Company worked to reinstate the safety exemption. After all, supporters pointed out, the ship is not seagoing; it plies the rivers and while emergency and safety planning should never be downplayed, supporters argued it’s not fair nor reasonable to expect a river craft to comply with ocean-based standards. As noted, the safety exemption is required in legislation. After many attempts over 10 years, the appropriate text finally became part of the Frank LoBiondo Coast Guard Authorization Act of 2018 signed by President Trump on December 4. The Delta Queen will be back in action in 2020. Importantly, the exemption does not dismiss modern safety concerns. To the contrary, the bill sets demands for upgrades, requiring, for example, “annual structural alteration to not less than 10 percent of the areas of the vessel that are not constructed of fire retardant materials.” So, in about 10 years, most outdated materials will be replaced. For the crew, the bill sets expanded firefighting and emergency training. Plus, the Coast Guard will write the implementing regulations. This has to be done thoughtfully because the bill allows the renovations to retain the vessels’ character and historical integrity. After extensive renovations in Houma, the DQ travels to its home port in Kimmswick, MO. Cornel Martin is President and CEO of the Delta Queen Steamboat Company. Martin said his company has been inundated by well-wishers from around the world, surely important for the Company’s upcoming plans, but also another indicator of a deep customer base for the river cruise market, with the right products. Martin said new boilers are the most critical upgrade. The current boilers were built in 1919 – for a never-completed World War I destroyer. The boilers went on sale. They were placed in a riverboat and the rest is history. Viking River Cruises’ effort to enter American markets is another project closely watched by industry observers. That’s because Viking has been working behind the scenes for at least four years to provide cruises on America’s rivers, starting with the Mississippi. In 2014 the company contacted MARAD with the outlines of an operating agreement. In 2015, Viking announced plans to build new American river-cruise vessels, ready in 2017. Unfortunately, a 2016 update announced a delay, until 2018. Among many industry observers, Viking’s interest in US inland river cruising is viewed as a critical indicator of broader and deeper success for inland rivers markets. Edison-Chouest will build Viking’s new vessels. Construction is just one part of an undisclosed agreement between Edison-Chouest and Viking that covers ownership and operations. This has been challenging because Viking is a European company and American maritime laws present difficult obstacles for foreign ownership and operation of passenger vessels on the U.S inland and coastal waterways. Simmons called the Mississippi River market “underserved” and Viking wants to bulk up fast. Cruises should start in 2021 and the company projects 18,136 first year customers. By 2027 Viking wants six vessels, each carrying around 380 people, for a season total of 103,431 customers, generated by 17 cruises per ship per year. Simmons hinted at a fast-moving timeline. He referenced “cutting steel” – actual vessel construction –as early as October. Again, not definite but implicitly sooner, not later. Viking sells tickets 90 days after construction starts. There’s nothing unusual, of course, about a company keeping its cards close about competitive business plans. There are, however, public policy issues linked to Viking’s project. On the one hand, cities like Dubuque have to be ready to “do something,” at some point, in order to be a host city. A certain amount of infrastructure and operational planning is required to safely land passengers at urban waterfronts. In response to Simmons’ presentation, Dubuque City Council has prepared requests for proposals on how to best move forward with Viking’s ideas. Simmons said that of 15 Mississippi River host cities he already has agreements with two of them – unnamed, during his presentation. Operations – must be controlled by a US-based entity meeting similar 75% tests. Very likely it’s the wait for confirmation of Jones Act compliance that keeps Viking from hitting the start switch. In his Dubuque comments, Simmons said that “all has been worked, everything is set up and legal, everything is done,” regarding Jones Act compliance, which Simmons brought up himself in response to questions about just how definite Viking’s plans really are. More specifically, Simmons referenced a completed “charter agreement” between Edison-Chouest and Viking. That sounds simple – far from it. “Charter agreements” for non-US companies get into a section of maritime law that makes Einstein’s relativity theory look like high school physics. In 2014, Viking approached the U.S. Maritime Administration (MARAD) with a proposed vessel management agreement that would allow the company’s US expansion. This was based on approval of a “time charter,” something relatively straightforward. In 2015, the Coast Guard’s National Vessel Documentation Center wrote that Viking’s ideas seemed okay, no problems. In 2017, MARAD wrote a letter with a similar sense of approval. At the end of 2018, just what’s in the “agreement,” if there is one, and where it stands, is shrouded in mystery. Hopefully, after four years of trying to invest and expand in the U.S., Viking – and its partners, from shipyards to financiers – will soon have the take-it-to-the-bank confirmation and authority everyone needs to “cut steel.” Recall Simmons’ comment that Viking’s efforts are moving fast. That’s relative, of course: a snail moves like a rocket compared to a glacier. An announcement from Viking could be just around the corner. If so, there are at least fifteen cities – promising a whole lot of fun – likely standing by with a bottle of champagne, ready to celebrate big news in 2019. 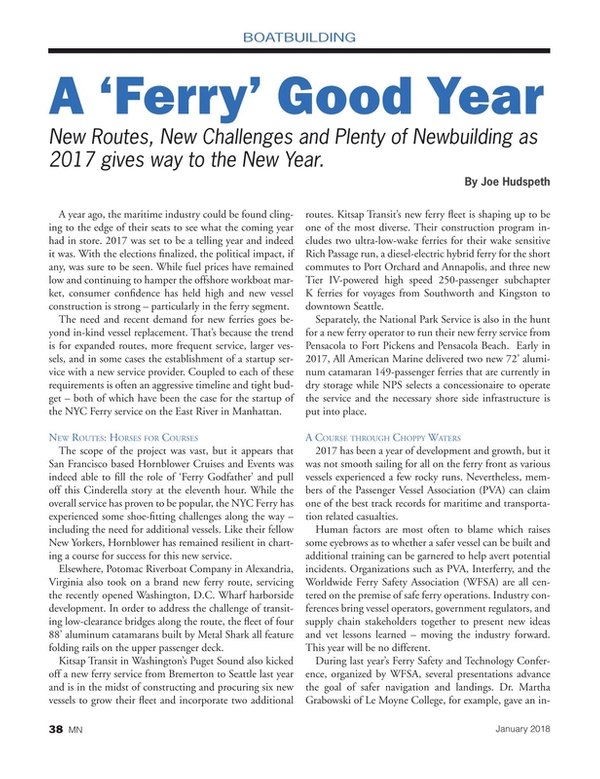 This article first appeared in the January print edition of MarineNews magazine.